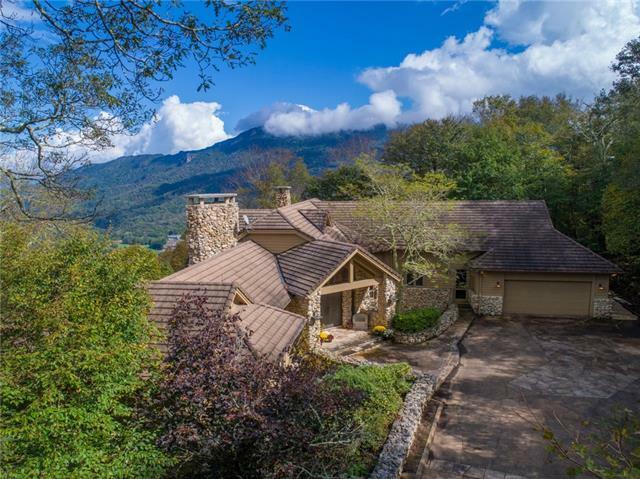 Panoramic mountain view potential from 4 BR/4.5 BA, 6000+/- SF architect designed, custom built residence at 4600 ft elevation on Linville Ridge. Create Bella Vista's once breathtaking views again by shaping tree control on this street to street, end of ridge, 2.3 AC lot. Extensive fenestration and expansive decks allow effortless enjoyment of natural light, mountain scenery, beautiful skies, fresh air no matter if you are inside or out. Spectacular contemporary interior with bold art deco influences awaits renewal from style-confident, appreciative buyer. Five fireplaces includes one in screened porch outdoor grille. Ensuite has fireplace, private deck to enjoy views plus his/her baths and WICs. Game room has bar, full kitchen, dumbwaiter to deliver food/beverages from upstairs, fireplace. Zoned HVAC. Oversized 2 CAR GAR has third bay for golf cart. Clean space basement. Tumbled Pennsylvania marble. Concrete tile roof. Multiple decks. Award winning golf, gorgeous clubhouse, spa, pool. Sold by Lyons Construction And Realty, Inc.. Offered by Lyons Construction And Realty, Inc.. Copyright 2019 Carolina Multiple Listing Services. All rights reserved.